OK, I’ll admit it: I WANT ONE! Didn’t think I did. Didn’t think any eyepiece in this focal length range could possibly be worth the approximately $600.00 TeleVue asks for its 13mm Ethos, 100 degree apparent field or not. After all, Unk has a perfectly wonderful 12mm Nagler Type 2 that has served him well for a decade and a half. Ain't I always saying, "The Only Enemy of Good Enough is More Better"? That, however, Bubbas and Bubettes, was before I got a chance to use an Ethos. When I did get that chance, during a recent expedition to the Chiefland Astronomy Village, I immediately began scheming to come up with them many, many George Washingtons I'd need to get an Ethos of my very own into my hot little hands. That is not the interesting part of this story, though. What is interesting is what made me start that scheming. Surprisingly enough, it was not the eyepiece’s huge apparent field that blew me away. What did it for me? The amazing optical quality of the Ethos; in a fast 8-inch scope it was impressively sharp to the edge of that gigantic spaceship porthole. And high in contrast. Despite less than perfect conditions, little M43 was amazingly well defined with its comma shape criss-crossed by easily visible dark lanes. Frankly, it looked as good as I've ever seen it--in any scope. Barrel or pincushion distortion? I didn’t notice anything of the sort. Astigmatism? Uh-uh. What I did notice was an incredibly immersive experience, something akin to what I felt when I looked through a Nagler for the first time. Stop the Presses Department: Just hours ago, at NEAF, Mr. Nagler announced the imminent release of a second Ethos eyepiece, an 8mm this time. According to Al it will be lighter, cheaper, and available in July. Or maybe Son of Skywatch. Or The Revenge of Skywatch. But most accurately The Return of Skywatch. 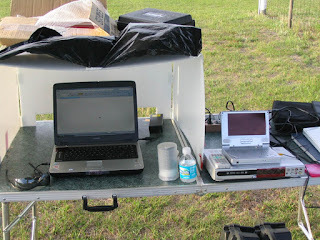 Yep...betcha thought that little old amateur astronomy newsletter from Possum Swamp was a goner, huh? "Traveling Light, Going Deep, Doing it Cheap"
And, as they say late at night on WTBS, much, MUCH more! As always, it’s free in the form of .pdf download you can get rat cheer. When will the next issue be out? Right as summer comes in, I hope--though I ain't a-promising. Let me know what you think of this one, and, as always, your contributions are solicited. What do I need? I used to think there was no way I would or could ever understand what it is like to give birth to a baby. That was before I wrote my first book. Writing a book about anything is a process that’s long, emotional, and, in the end, usually more than a little painful. To be specific, my new one, tentatively titled Choosing and Using a 21st Century Schmidt Cassegrain Telescope (the boys and girls in marketing prob’ly won’t like that and will insist on more-better-gooder) subjected me to a year-long gestation period that culminated in the birth of one slightly overweight bouncing baby CAT book. Didn’t start out to be that-a-way. In the beginning I foresaw a minor rework and revision of the original, Choosing and Using a Schmidt Cassegrain Telescope. 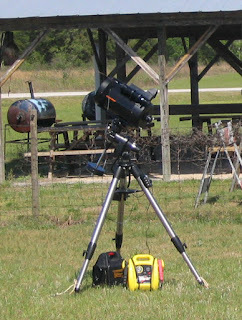 Sure, there’d have to be more material on go-to scopes—at the time Choosing and Using was written, all there was from Meade and Celestron was the LX200 Classic and the Ultima 2000 (the NexStar was released just as the book was being finished-up). Choosing was aimed at the vast majority of CAT using amateurs of the time: folks interested in "manual" fork mount SCTs. 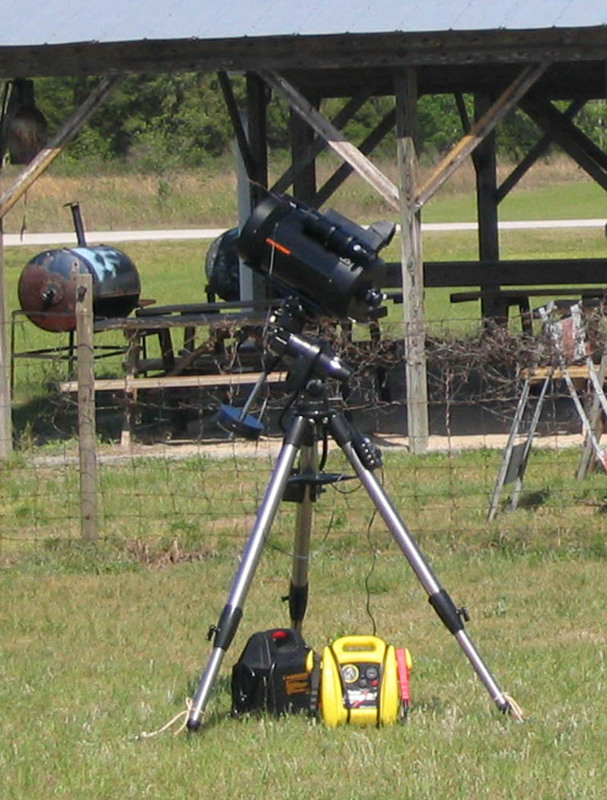 Go-to, schmoto…the name of the game back then was learning to polar align a wedge mount scope. Luckily, the selfsame marketing types mentioned in paragraph one had different idees. According to them, new editions of books just don’t sell well. If I wanted there to be a new SCT book (they said) I’d have to do more than just revise a chapter or two; I'd need to write a new or almost completely new book. The more I thought about it, the more I actually came to like the idea. I think Choosing and Using holds up pretty well, but there were and are things I did not like about it. Starting with the prose. OK. Workmanlike. Sufficient. Doesn't make the Possum Swamp coyote pack start howling. But with a decade’s more experience in pro writing, I knew I could do better. It also became clear that, in addition to a redo of the Buyer's Guide chapter, the material on film astrophotography would mostly need to be replaced. I wouldn’t just be able to mention CCDs and let it go at that, either. I’d have to give newbies a good general grounding in the digital imaging game or there wouldn’t be much point to doing an imaging chapter. And how about DSLRs? And Webcams? Then there was the project section. I still liked the stuff in it, but knew there should be more. I briefly considered scrapping the projects altogether, which drew howls of protest from the original book’s fans when I let the word slip. The troubleshooting guide would need almost complete revamping--due to the dominance of go-to electronics, of course. There was also the matter of the book’s pictures. There should be more, many more. And better. I wasn’t satisfied with Choosing's index, either, or its lack of appendices. Furthermore—well, y'all get the idea. When I began work, then, I was determined I would be undertaking an almost complete rewrite, not merely a revision. If you’re a fan of the original, you will notice a vaguely familiar passage or a hand-me-down paragraph here and there. But mostly it’s new from the ground up. I just hope that for once The Only Enemy of Good Enough is NOT More Better. Be that as it may and will be. The manuscript is on its way to New York City as we speak and I’m feeling relieved if somewhat let down (post-partum depression?). 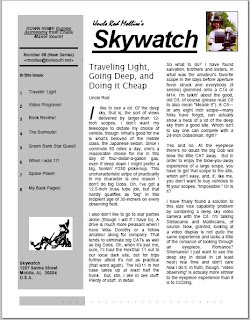 To cure the “wadda-I-do-now?” blues, I’m hard at work on a new issue of my little Skywatch newsletter. That’s right, as promised it will carry on. I hope to have a new issue ready for y’all in a week or two. That being the case, if you’ve an article you’d like to see in Skywatch, send it on, there is still time. And there’ll be a “next one” after that, too, if not necessarily real soon. Yeah, amateur astronomy is about patience, muchachos. 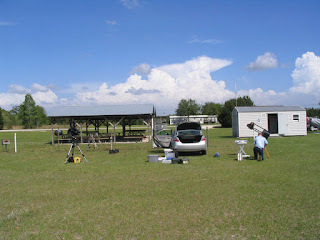 You load up the car with a ton of equipment and drive 6 or 8 or 10 or 12 hours to a dark site only to be greeted by CLOUDS like those in the picture on the left. If you can’t stand the occasional disappointment (the technical name for which is "A GOOD SKUNKING"), your involvement in our avocation may be a short one. After a while, some amateurs become downright skittish when it comes to weather, I've observed. That isn't hard to understand. Who wants to pay four-dollars-a-gallon for gas (almost, anyway) only to sit under a tent canopy or in a motel room in some out of the way Timbuktu and watch it rain? Sadly, some of these folks get to the point where if the weather forecast doesn't sound perfect, they will stay home. The end result being they never see much at all—not from dark sites anyway. The way things oughta be? Come to realize amateur astronomy is also a pursuit for the optimistic; that it is, like almost any worthy endeavor, about risk taking. Damn The Weather Channel, full speed ahead! 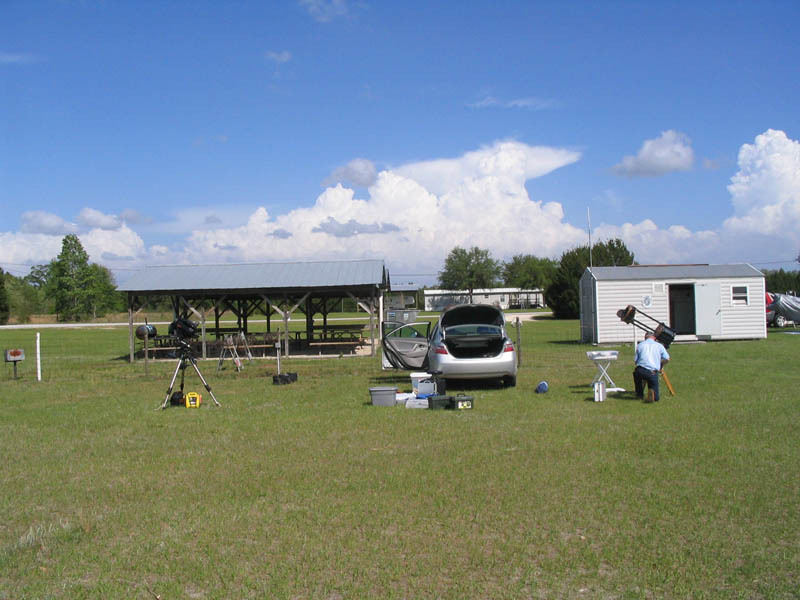 Yes, I'll admit I and long time observing companion Pat Rochford spent the week before our latest Chiefland Astronomy Village expedition anxiously following the weather forecasts for Chiefland, Florida. Didn't look too promising. So unpromising, as a matter of fact, that nobody would have faulted us if we’d just called the whole thing off. But we didn’t. Both of us have been in this game for more years than some of you have been alive, and well know that the amateur astronomer who takes the weatherman 100% seriously is a fool. Think back to those times you turned-in early at the star party only to have to listen to multitudinous tales of deep sky conquests the next morning: “Boy howdy! Cleared right up at 10:30pm--wasn't that just after you went to bed? Never saw so much good stuff!” In my 44 years of observing, I've found that happens more often than not. It’s the rare weekend when there ain’t a few hours of observing time, and if the site is dark enough those few hours can be (more than) enough to make the whole thing worthwhile. Which is what happened to us this past weekend. When I headed to Pat's to pick him up, I wasn't overly hopeful. There were clouds to the east as far as the eye could see. Heck, before we could even get Pat's gear loaded, it had begun to sprinkle rain. Rain or no rain, I don't know how we managed to get Pat's 8-inch ATM Newtonian, his EQ-4 (non-go-to CG5) mount, his accessories, and suitcase in the car with all my junk--which included my C8, Celeste, her CG5 mount, the Stellacam 2 video camera, monitor, DVD recorder, accessory boxes, a tailgating canopy, and all the other stuff I need to do a video run Down Chiefland Way--but we did. Our hopes were not high, but we pointed Unk's Camry east on I-10, anyhow. The weatherman said we shouldn't have any hope, but we did, and it was soon bolstered. Over the years we've been making the Chiefland run, we've become so accustomed to the sky beginning to clear when we leave I-10 for Highway 19, The Florida - Georgia Parkway, just past Tallahassee, that we not only hoped for that, we expected it. And guess what? As we refueled the car and ourselves at the Sunoco station via the attached Wendy's burger joint (Pat) and the crazy array of junk food (moi), the clouds did indeed seem to be thinning. Imagine that; our "never been skunked" record at CAV seemed as if it would hold. Checked into the Holiday Inn Express in Chiefland, Pat and I made tracks for the good old observing field. What did we find when we got out there? We could hardly believe it, but more stinking clouds. The skies sure didn’t look overly promising when we arrived--heck, they were downright depressing--and it would have been easy to give up hope then, but then, suddenly, the weather began to change for the better. 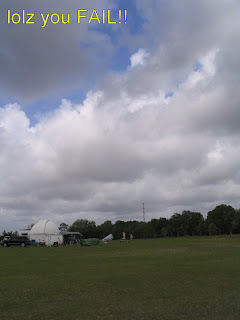 Certainly it was at least good enough to encourage us to set up the telescopes, and by the time we'd returned to town for a shopping trip to WallyWorld and had had dinner at the esteemed Bar B-Q Bills, the sky, if not pristine, was looking amazingly good, campers. We got four - five good hours at this outstanding site Friday evening (taking into account occasional cloud-sponsored intermissions). I concentrated on the early spring marvels, and began putting a toe back into the deep waters of the Herschel 400, which I am finally resolved to finish. Since I was using the Stellacam II, not much I went after escaped me. The only bummer was that as the evening wore on, the the slight haze that had been present most of the night began to thicken. I didn't let that stop me. The Stellacam and the CG5 performed superbly, not missing a target and cutting through the increasingly messy sky like a hot knife through butter. I have an Atlas EQ-6 mount, but the CG5 is much more pleasant to haul around, and it's all I need when I'm not doing long exposure imaging. Yes, one windy night Down Chiefland Way with the CG5 last year impelled me to buy the Atlas, but most of the time the CG5 is just fine. In fact, I'm not hesitant to say that Stellacam + CG5 = darned near perfect. Before the evening was out, we'd not only viewed the spring galaxies, but the sinking winter wonders, including M42, natch. And we'd viewed them with the 13mm Ethos eyepiece one of our buddies let us try in Pat's scope. What did I think? My words to Pat after a look at the Great Nebula floating in that huge field tell the tale: "I MUST HAVE ONE!" We kept up our deep sky tear until the wee hours despite degrading conditions and dew so heavy I began to feel like I was observing in a rainstorm. I had done a pretty good survey of the better H400 spring galaxies before the clouds moved back in with a vengeance, the last sucker hole evaporated, and we departed for the Holiday Inn at 2:45 in the a.m.
Back at the motel, to the tune of much self-congratulation about us skunking the weatherman for once instead of vice-versa, we tuned in The Weather Channel, which was absolutely firm in its dire predictions for the morrow. A scary-looking front accompanied by sometimes severe weather (winds, hail, strong thunderstorms) was slated to move through the High Springs (Chiefland) area. We enjoyed our Saturday morning and afternoon despite building clouds that suggested TWC was 100% correct in their predictions for once. 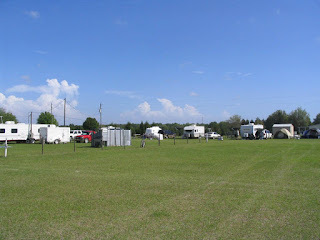 We trotted around the field, schmoozing with friends old and new, visiting with Tom and Jeannie Clark, and hitting the Chiefland McDonald's for lunch. Don't tell him I told you this, but I witnessed Pat devour two McRib sandwiches. Another tour of the Wal-Mart in late afternoon, and it was back to the field to see what Ma Nature had in store for night two of our two-night observing run Down Chiefland Way. To cut to the chase, the front did begin to move through in late afternoon with clouds that threatened to thicken into overcast. Cockeyed optimist Unk kept his fingers crossed and kept watching the weather thanks to the invaluable CAV Wi-Fi. It wasn't just the Wi-Fi that helped, but a program I've been using for a little while, Starry Night Pro Plus 6. You have probably heard this humongous planetarium program will do everything from displaying a realistic CCD sky background to filling you in on the details of the dimmest PGC galaxy to controlling your goto scope, but did you know it does weather, too? A click of Mr. Mouse and SNPP will display satellite weather maps. Another click and you can have a look at the Clear Sky Clock predictions for your current site. Took me a while to get friendly with Starry Night, but when I did, one word came to mind: "awesome." If nothing else, SNPP is probably the most realistic and beautiful depiction of the night sky you can get for your PC (or Mac). Mainly because it includes the aforementioned CCD sky background (the program that originally featured that, Desktop Universe, has been incorporated into Starry Night Pro Plus). The sky you see onscreen in this program is the real thing assembled from a huge mosaic of images, not just computer drawings. What the weather satellites and the Clear Sky Clock and the other Internet weather resources I pulled up seemed to be saying was that there was some hope. I told Pat that it appeared to me the clouds just might swirl around CAV, leaving us under crystal skies--for a while, anyhow. Given the prevalence of the color red on the weather maps, I can forgive Pat for being skeptical, however. By 4 p.m., he'd finally convinced me that we needed to pack up and head to town. No viewing tonight, and who wants to pack wet gear in the morning? I wasn't really convinced, I'll admit, but hopeful is one thing, foolish is another. Somewhat half-heartedly--make that mucho half-heartedly--I began to break down my gear . With the weather having been iffy the whole time, I'd never got around to putting up the tailgating canopy, so it was short work to get the equipment in the Camry. Not that Unk was happy about it. For once, your silly Uncle was right about the dadgum weather. I swear, by the time we were halfway to Chiefland it was obvious the overcast was breaking up, and clearing, temporary though it might be, was in the offing. The weather did turn ugly before the evening was out, and I suppose it was a good thing I had Pat along to appeal to the better angel of my nature. Still, I thought we had jumped the gun a wee bit. I suspected we could have got an hour or two in and had plenty of time to pack and skedaddle before the storm. Ever since, I've been wary of giving up the game too soon. So, we'd left the field. Did we turn the car for Possum Swamp? Hail (literally) no. Didn't seem like a bright idea to navigate I-10 with darkness and bad weather on the way, and there might be some slight chance we could head back to the field in a few hours and at least do some binocular looking once the front blew through. Hah! The thunder that began to shake, rattle, and roll the Holiday Inn in mid evening gave the lie to that. Like they sometimes do in this area, the front put on the brakes and dumped rain into the wee hours. Well, the Rebel Yell and cable TV was good anyway. Yes, we were skunked Saturday night, but we were not skunked Friday, and when you count up all the partial evenings and partial weekends we’ve observed through over the years, you can bet we’ve seen a lot more than the “says partly cloudy, guess I’ll stay home” bunch. If nothing else, the whole thing was educational, muchachos. In addition to having my reluctance to give up the ship too soon underlined, I learned the value of allowing yourself a third day in Chiefland. Given the site's highly unpredictable weather--you are often under fronts rolling in off the Atlantic and colliding with ones coming in from the Gulf of Mexico--two days can spell S-K-U-N-K more often than not. Give yourself a third night, or, even better, a fourth, and chances are good, if not assured, that you will see something. And that's all I need. A scant hour or two under the velvet dark skies of Chiefland are enough to at least partially recharge my deep sky batteries and keep me going for another few months before heading back down to battle the weatherman again. 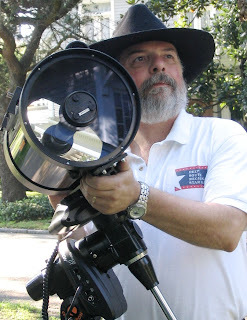 For you Chiefland Star Party fans, here’s a bit of welcome news. The full-blown CHIEFLAND STAR PARTY will be back this November. 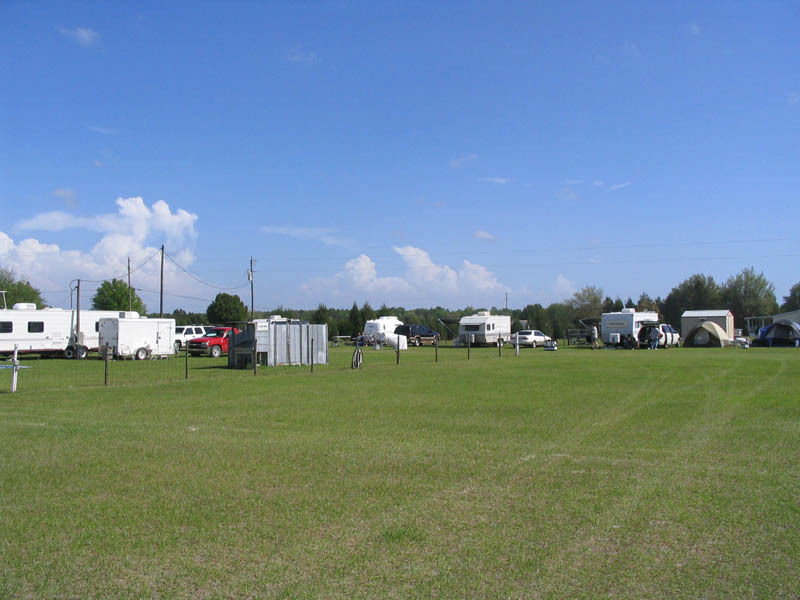 Yep, this well-loved event is being restarted on CAV’s new and larger observing field. I predict a great time will be had by all.